Shirts With Random Triangles: Rumor: Indianapolis Colts Showing Interest In Nick Saban. 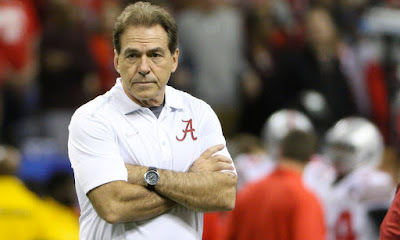 Rumor: Indianapolis Colts Showing Interest In Nick Saban. Nick Saban. Image via touchdownalabama.net. From "The voices in your head don't count as reliable sources" department comes rumors that the Indianapolis Colts may be interested in a certain Alabama head football coach. Bob Kravitz, the Indianapolis-based reporter who broke the "Deflategate" story, told Sirius/XM's Adam Schein that the struggling Colts may fire head coach Chuck Pagano at the end of the season. One of the coaches on the Colts' list to replace Pagano is allegedly Alabama hard coach Nick Saban. "...But I think it comes down to this: Jim Irsay is going to make the next coaching hire. If he brings in a guy who demands full power - like, say, a Nick Saban, who I think he's going to go after - if he brings in a Nick Saban, he's going to have full power and that means that (Colts general manager) Ryan Grigson will either be kicked to the curb or he'll have a different role in the organization. If he brings in a Pagano-lite, another offensive or defensive coordinator, I think that Grigson stays. So I think it's really a 50/50 proposition at this point." The question of course is whether Saban would abandon the Crimson Tide for another shot at the NFL. Saban's stint as the head coach of the Miami Dolphins is the biggest black mark on his otherwise stellar head coaching career. The question gets foggier with the Colts' struggles and the health concerns starting to spin around starting quarterback Andrew Luck. Alabama is currently in the College Football Playoff hunt once again. New speculation that Saban might make a jump back to the NFL could become a distraction if not handled quickly.